This is one of my all-time favorite dinners and I’m really excited to share it with you! 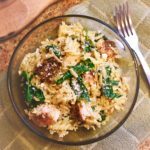 Orzo has become one of my new favorite ingredients to cook with. For those of you that may not be familiar with it yet, it’s in the pasta family but it’s very small and resembles rice more than actual noodles. It’s so versatile and super easy to cook up. So how does this wonderful dish come together? It’s pretty simple! First, cut chicken into large chunks. Then, season the chicken with some salt, pepper, garlic powder and Italian seasonings. Add a little olive oil to a pan and heat over medium-high heat. Toss and cook until chicken is browned and cooked through. Place chicken on a plate and set aside. Once orzo is done, drain it well and then return it to the pot. 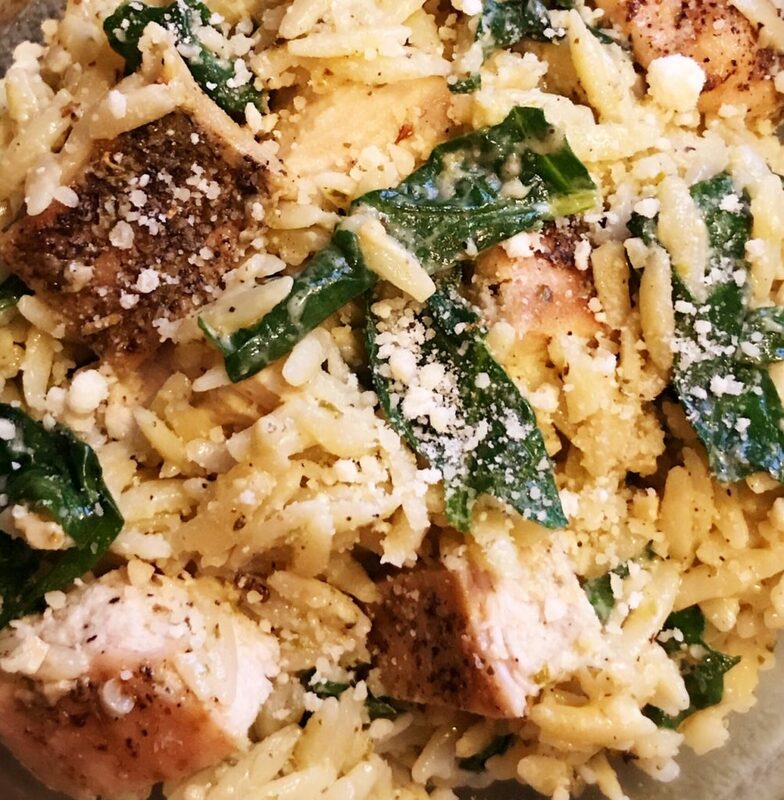 Tear up the spinach and toss it with the orzo. Allow it to sit for a minute so that the spinach wilts. Then, add the cooked chicken to the pot. 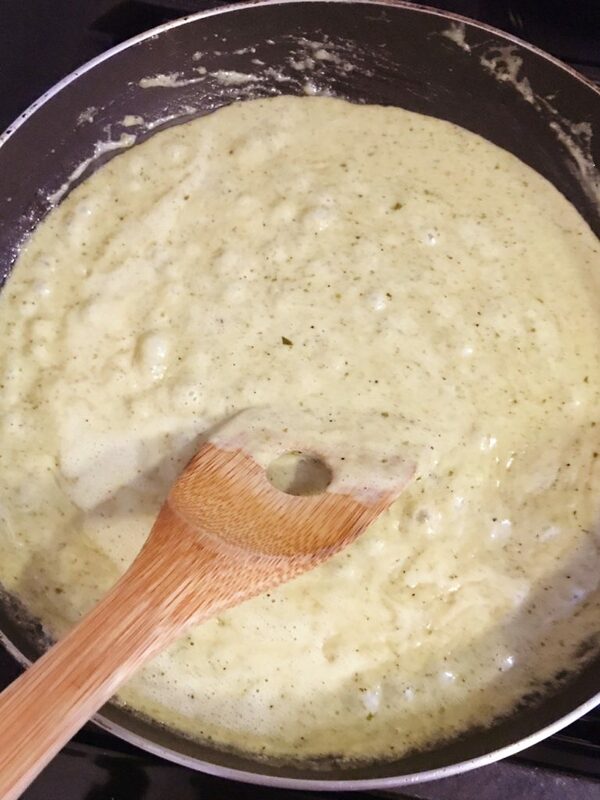 Once the orzo is close to finished, you can start your sauce by adding the heavy cream, Parmesan, pesto and garlic to the same pan you used to cook the chicken. Cook over medium heat and bring to a boil. Continue cooking for about 5 minutes or so, stirring constantly. 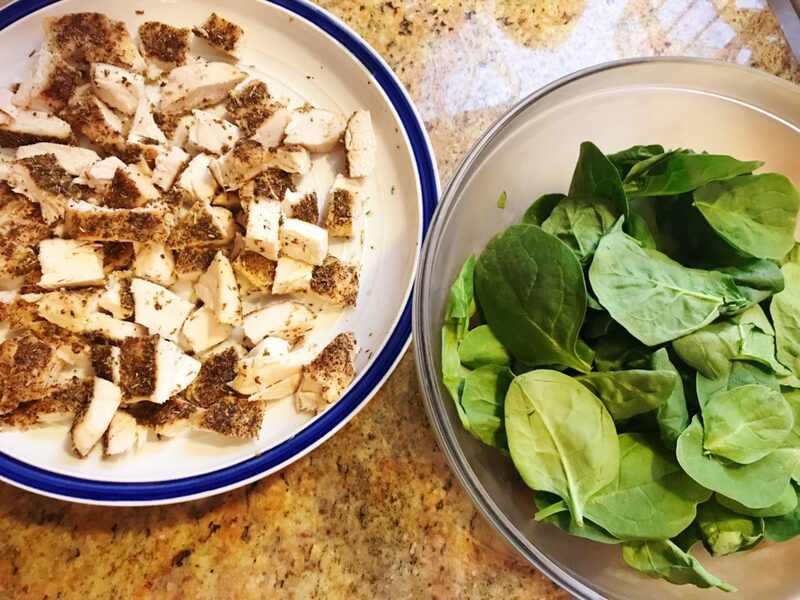 Pour the creamy pesto sauce over the chicken and orzo mix and toss it all together. Serve immediately and sprinkle with some additional Parmesan on top, if desired. **I feel like you can change this up in so many ways. I think next time I might try adding bacon to it instead of chicken. You could also add some of your favorites veggies, like zucchini or toss some diced avocados with the dish right before you serve it. Easy chicken dinner with TONS of flavor! This dish really comes together because of a super simple creamy pesto sauce that everything gets tossed with at the end. Cut chicken breasts into small chunks. Season with salt, pepper, garlic powder and Italian seasoning. Heat olive oil in a pan and add the chicken. Toss until chicken is browned and cooked through. Place cooked chicken on a plate and set aside. 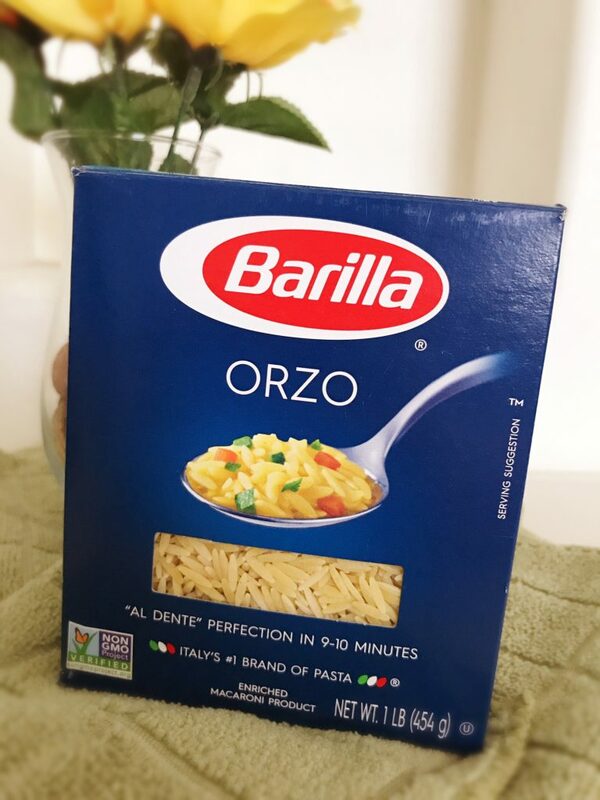 In a large pot, boil water and cook orzo according to package (usually you boil it for 9-10 minutes). Once it's done, drain it well and return to pot. Do not rinse the orzo. 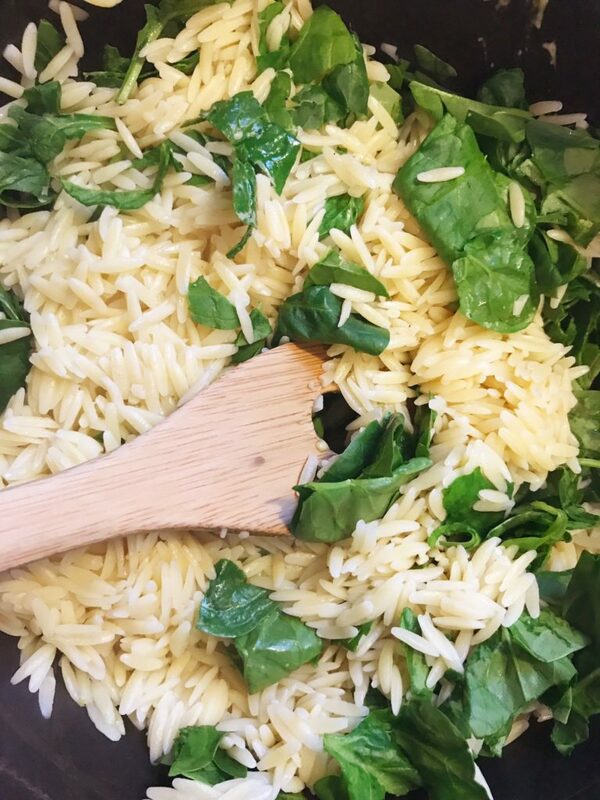 Tear up the spinach into small pieces and add it to the pot with the orzo. Toss it together so that the heat from the orzo begins to wilt the spinach. Allow it to sit for a minute, then add in the cooked chicken. While orzo is cooking, add the cream, pesto, garlic and Parmesan cheese to the same skillet used to cook the chicken. Mix it all together and heat over medium heat. Bring it to a boil and cook for about 5 minutes, stirring constantly. Pour the sauce over the chicken and orzo mix in the large pot and toss everything together. Serve immediately and top with additional Parmesan cheese, if desired. *I use a basil pesto and any brand works! I typically use the Kirkland brand from Costco. It's cheaper than the grocery store brands and it's delicious.